Today I have a great post! Last year I interviewed Marie Lu, you can see that interview here, but I still wanted to feature the book this year! Introducing Nicole from The Reader's Antidote, and her amazing guest post! 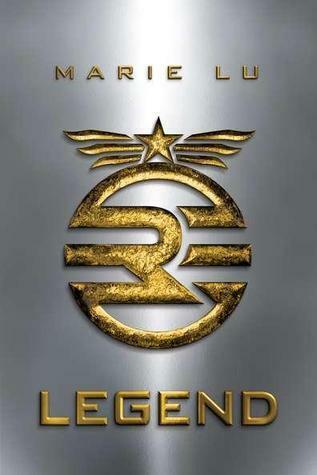 Read it, then enter to win a signed copy of Legend! I saw the headline of an article like this somewhere a while ago and thought it was a great idea. I didn't read the article, but I could make guesses about what they were going to say. So here's what I think about why teens love dystopians, and how Legend by Marie Lu fits into all this. When I read Legend, I felt like I was just getting into dystopians, but all of a sudden people weren't interested in them anymore. I was wrong. So very wrong. Dystopians were starting to all be the same and people were getting annoyed. But Legend kind of threw that out the window. The first thing is the multiple point of views, one from June and one from Day. The way the book is formatted, June's words are in the normal font and the usual black color. But Day's words are in a computer-like font and a gold color. That was one of the first things that originally annoyed me about this book, but I grew to love it. It made it very easy to tell who's head we were in, and I think that really speaks to teens (no pun intended). I know as a teenager that keeping up with one person's thoughts was sometimes hard for me (especially since sometimes I was skimming... *turns away shamefully*), and this really gives the reader two very separate voices. Teens always feel the need to be unique, which is what Legend did for its characters. This was also one of the first dystopians where it was actually in two points of view. And somehow, even with being in Day's head (who's the love interest), he remained somewhat of a mystery, as did June. You never really knew what either of them was going to do next. A big reason that teens love dystopians is that teens' lives are like soap operas. There's really no getting around that, whether you're one of the popular people, a geek, a jock, or a recluse. Someone is always thinking they're better than someone else or are having self-esteem issues. And the drama! Well, dystopians take drama to the extreme and it literally is the end of the world. Teens like taking things to the extremes, so when they read about this world that has fallen apart, they feel they can relate because at one point or another their own world has felt like it's ended. The romance is also often very real in dystopians, and there was no exception with Day and June. Day is a street rat (AKA a geek, nerd or loner by high school standards) and he has to do everything he can just to feed himself and his friend. He has no family, and believe me, there was many a time where I wish I had no family. June, on the other hand, is in a position of power. She's lost her parents too, but she still has her brother and she's certainly not feeding off scraps. She's like the popular girl that everyone fauns over but secretly sort of hates because she has it all. And when these two are put together by circumstances, it's like Breakfast Club all over again. The characters themselves are relatable, and despite the fact that they're in a post-apocalyptic dystopian world, they're still teens and have the same basic problems and interact socially the same way. Prodigy, which is the sequel to Legend, brings up even more issues that teens can relate to. There's always something teens think is better, like the iPhone 5 or the next Call of Duty. It's something they don't have, and something they'll do anything to get. Well, anything in a teenager's head never goes as far as death. But it's taken to that level in Prodigy, just as it was in Legend. Again, it's the life-or-death feelings that teenagers align themselves with. The characters are in search of something they once thought never existed, but they know that if it does exist, they will be safe. It's that mixture of danger with the promise of finally being safe that teens connect with. Marie also brings up the issue of sexual orientation, and it involves someone close to her. I'm so glad this issue was faced, because it's not mentioned enough in YA. Dealing with someone close to you being gay is a shock at first. Someone you've known for so long, and you thought you knew them, and then you find out through someone else that they were gay, is hard to digest. It's especially hard on teens because they trust so completely, so this was a really relatable element that was brilliantly added to this already epic tale. So why should you jump on the dystopian bandwagon? Because of books like Legend. It's a world so separate--so different--from our own, and yet the human element is still the same. The problems don't change much. Sometimes they become more deadly, or less important. But teens can relate to dystopians because they feel like they're living one every day. They go through challenges that people out of high school laugh at now, but for them it really does feel like one decision is the difference between living and dying. And that's why teens love dystopians; because they find themselves in a world where your decisions and your choices really do matter, and to more than just you. In dystopians, the teens make the difference, not the adults. You can win a copy of Legend! Today's giveaway is hosted by The Reader's Antidote. Head on over to win. This giveaway is open TO US ONLY. Hey Enna! Thanks for having me and I'm glad you got the e-mail on time. Just one thing: at the bottom where it says what the giveaway is, you put The Girl of Fire and Thorns instead of Legend. In case you wanted to change it. Happy Birthday! I loved reading the guest post. I like dystopias, although I think I've become a little burned out by them recently. Hopefully once I get back in that mood I can try this book, because I've heard it's good. You've hit the nail on the head!!! That's exactly why I love Dystopians. They can seem SO similar and yet be so different at the same time. Thanks for your perspective on Dystopians. I enjoy reading a good Dystopian myself. I loved Legend! I can't wait for Prodigy! I'm still loving the dystopians! Not getting bored at all. I agree that Legend retained a certain uniqueness that differentiates it from the other Dystopians. I can't wait to read Prodigy! And I love these covers!!! I would think your right...except I have the teenager that is the exception to the rule. She doesn't care for them at all. Great post. Teens do love their dystopia. Get 5 extra entries to ALL giveaways!